Every single one of my guitars is the product of a long, intensive process. I call on all my knowledge and experience in order to produce high quality instruments. This is why I never build more than two guitars at the same time so that I can concentrate on every detail. Since the sound of the instrument depends greatly on the type of material I only use the best quality tone woods and no prefabricated parts at all. A guitar is not finished until it completely satisfies my demands for a clear, open sound with full, round basses, velvety facials, a clear, brilliant trebles, moduled timbre, a singing, sustained tone and responsiveness. Only when I am satisfied that all these criteria have been met is the woodwork finished and the body closed up and polished with shellac. The results are melodious, unique pieces and professional instruments for guitarists. 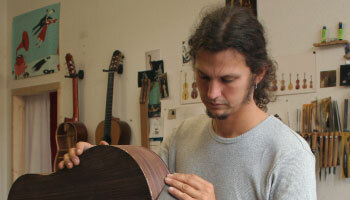 My work is based on the Spanish Granada tradition of guitar making using time-tested techniques. The methods incorporate an analysis of historic guitars and modern insights into acoustic processes and the wishes of today’s musicians. Whilst I am very traditional, I am also open to experiments. I try to combine traditional instrument building skills with modern methods in order to develop the sound of the guitar for the future.